Anastasios S. Dontas - Seven Countries Study | The first study to relate diet with cardiovascular disease. Anastasios – or the anglicized “Andy” – Dontas (1921-2016) is credited for his role in the practical operations of the surveys on the Greek Islands in the 1960s and for the intellectual stimulation of the Greek team. Dontas’ role as the lifeline between Greece and Minnesota isn’t surprising, since his graduation from the University of Athens in 1946 was followed by an additional education in Michigan. He was also a frequent visitor of the Laboratory of Physiological Hygiene and Division of Epidemiology at Minnesota. After the initial surveys he remained an active participant and coordinated the long-term mortality follow-up of the Corfu cohort. Over the years, Dontas provided the ideal complement to the sober Aravanis as co-investigator for the studies on the Greek Islands. His industry and his personal researches in gerontology were a driving force to independent publications from the Seven Countries Greek populations. His interest in gerontology not only took the Greek part of the Seven Countries Study in another direction, but it made him a leading expert on the subject. 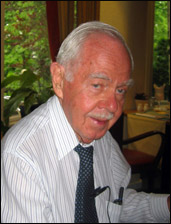 Dontas was an expert advisor of the World Assembly of Aging of the United Nations in 1982 and on problems of health in the elderly of WHO (1984-1988).